From the earliest surviving examples in the 9th century, Islamic binding represents not only the incredibly varied talents of centuries of artists, but also the historical influences of the Islamic culture, and the mixing of Islamic artistic traditions across both kingdoms and continents. 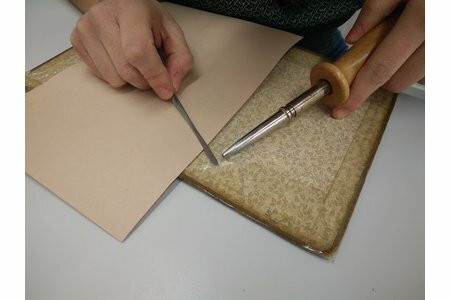 In May 2014, the book conservation postgraduates faced the task of condensing this long-standing and rich tradition into three intensive but rewarding days. Under the leadership of Kristine Rose, Conservator of Manuscripts and Printed Books at the Fitzwilliam museum, we completed our own generalised Type-II Islamic binding models. Our study only scratched the surface of their history, but we gained an inspiring perspective on the value associated with these binding structures. The Islamic codex was developed in part due to a need for a complete and tangible recording of the Qur’an that could be easily transported as Islam spread. Historic Islamic binding styles can be found from Indonesia to Spain, and across North Africa. Binders from Yemen, Persia, the Ottoman Empire, and Mughal India (to name a few) left their own mark on the increasingly ornate decorations associated with Islamic bindings. 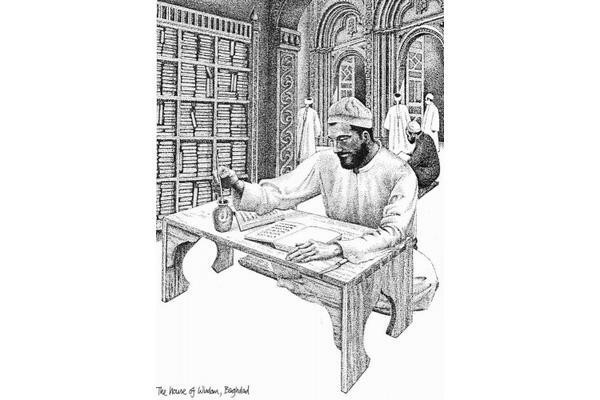 By the Middle Ages, the Arab invasion of Northern Africa resulted in increased trade routes; consequently, Islamic books and paper, which had been developing over centuries, became highly valued trade items. Today, Islamic bindings still remain revered for the religious text they convey, their detailed illuminations, and the artistic structure of the binding itself. So you want to make a model? 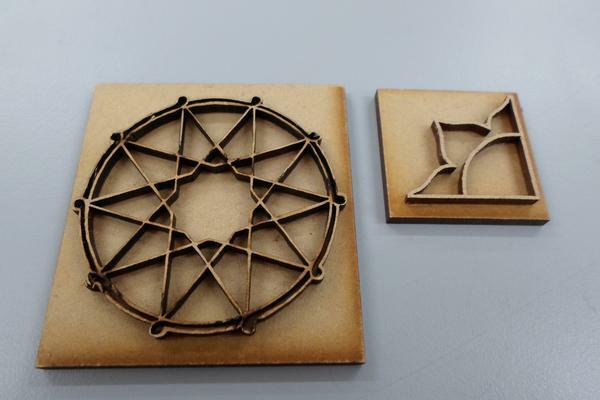 Despite having a decorative finish, Islamic binding structures required less equipment (sewing frames, etc) to complete than other historical binding types. 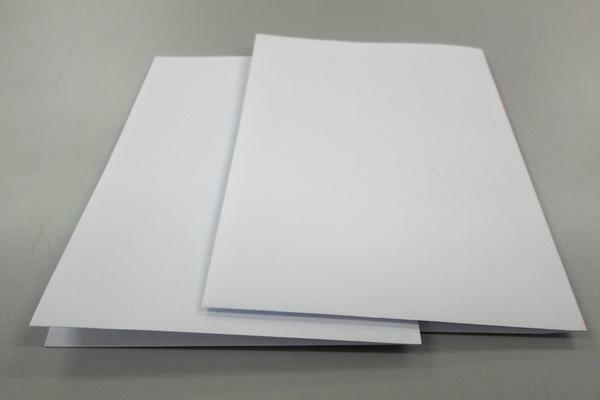 Our textblock was made with 20 quires of 80gsm A4 printer paper. Why printer paper? Islamic paper is characteristically heavily burnished, shiney and smooth. This meant that printer paper was actually quite similar in texture. If you wish to make a model, printer paper would be an easy substitute to use. One quire—made up of 2 folded sheets of A4 printer paper. We folded and pressed 40 sheets of A4 paper into quarternions. Our model had two sewing stations, which is common traditionally, and they were marked by eye to divide the spine approximately into thirds. The sewing stations were then cut in with a craft knife for ease, although in historic bindings there is no evidence of pre-piercing. For sewing, an unsupported link stitch was used with silk thread. 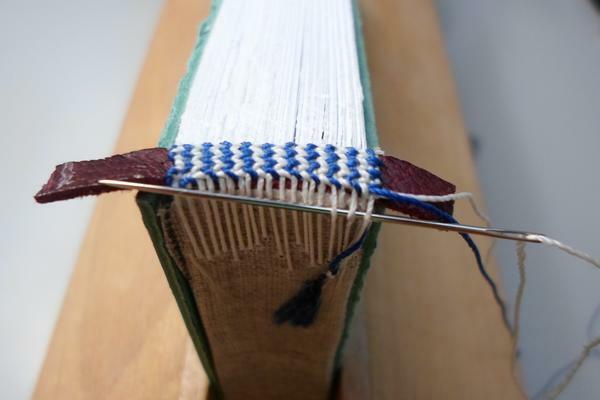 When complete, the ends of the thread were trimmed down and pasted to the spine. 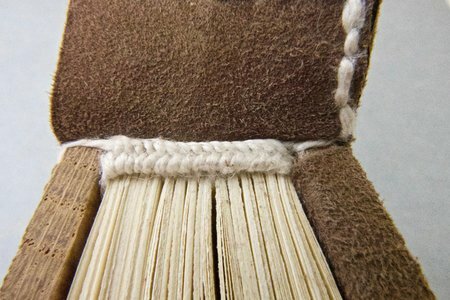 A strip of linen lining was then pasted to the spine, with an additional 1 ½ cm width on either side of the spine. This extra width of linen could later be used to aid board attachment, but was sometimes just trimmed away or pasted to the side of the textblock. Our Islamic binding model used both a primary and secondary sewing to create a chevron-patterned endband. A subsequent post will describe how to make this. Historic Islamic bindings commonly had thin paste boards, created using layers of paper pasted together to a desired thickness. Due to our limited time, the boards for our models used two layers of 2mm millboard, laminated to create rigidity, and the right thickness. 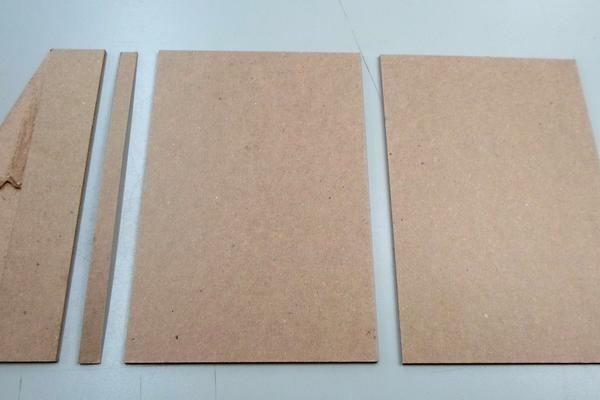 Boards (from left to right): foredge flap, foredge strip, bottom board, top board. 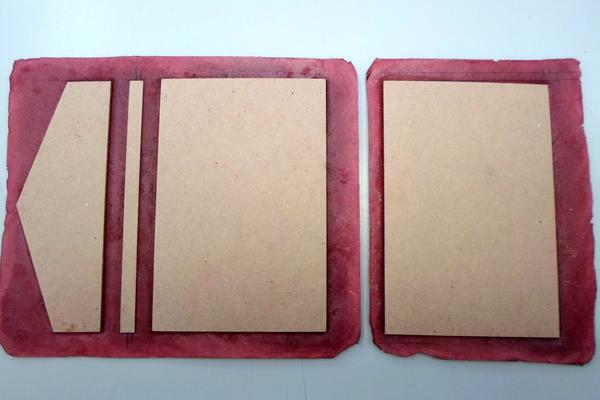 The front and back boards were cut to the exact height of the textblock. Their width was the width of the textblock minus the endband thickness and 1 mm. When on the book, these boards sat flush with the head, tail and foredge of the book, and just up to the front edge of the endband on the spine edge. Our board for the foredge flap was first cut to the exact height of the textblock and half the width. Before laminating, the board was trimmed to create a triangular edge. At this stage, the boards can be recessed to fit the typical panel tools. I chose to use a flower design cut out of this top layer, then the two layers of the foredge flap were laminated together. My flower relief, cut out of the top layer of board on the foredge flap. The final piece of board was made up of only one layer of board. It was called the foredge strip, which was the height of the textblock and approximately 8mm less than the thickness of the textblock foredge. This strip rested directly in the middle of the foredge when the textblock was covered. 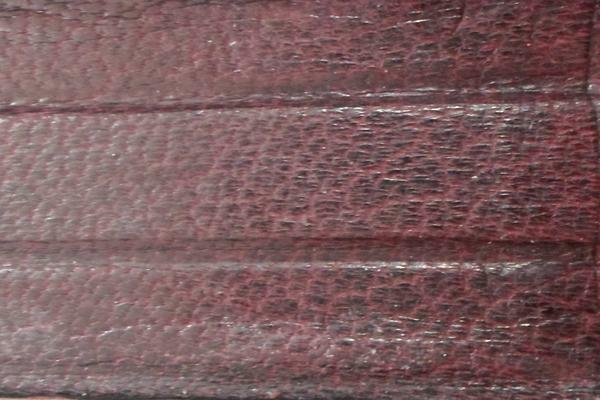 For our binding we used red goatskin leather, split to 0.7mm. The thinner the leather is the better, so you could go thinner than ours. 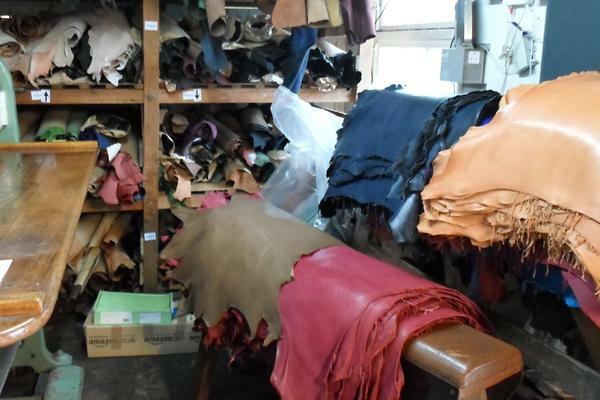 Brown and red shades of leather are quite common historically, although many colours and materials are seen. Harmatan and Oakridge leathers on display in Higham Ferrers. 1) The first section covered the front board, with 1 ½ cm turn-ins at the head, tail, and foredge. The spine edge was left wide enough to cover the text-block spine (which for us was a width of approx. 2cm). The spine edge was pared down very finely, so that when it is adhered to the spine you won't be able to feel the edge. Even if the paring was a little wobbly here, the uneven edge actually helped it to blend in more easily! 2) The second section of leather fit the back board, foredge strip and foredge flap. 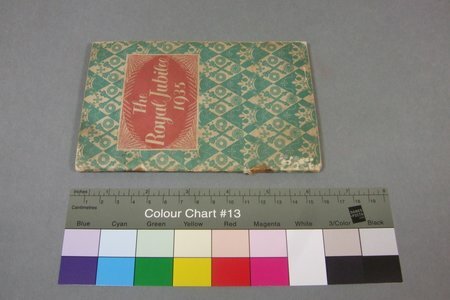 Ours had enough leather for 1 ½ cm turn-ins and a spine strip that was finely pared. 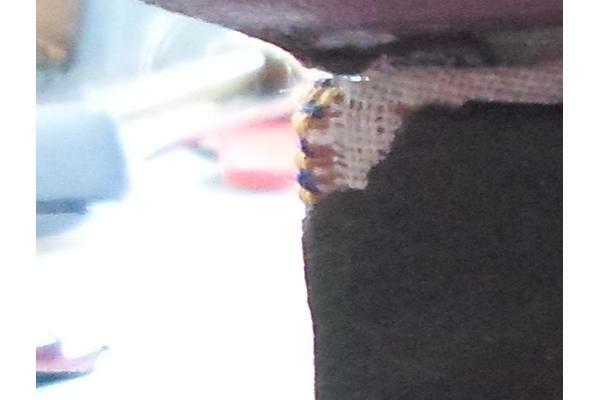 3) A third strip of leather was cut to fit within the inside of the foredge. The strip was the height of the textblock minus 2mm at either end. Its width covered from few millimeters over the edge of the foredge flap board down over the foredge strip and up another few millimeters over the back board. This leather was pared thinly on all edges, as well. The boards were pasted in place on the leather with wheat starch paste, so that the inside of the boards were facing upwards. Boards pasted to the flesh side of the leather. On the ends of both sections you can see where more leather sticks out, which will eventually cover the textblock spine. At this point, it was best to make sure that the leather was worked smooth against the boards and around the edges. We used a bone-folder to work the leather around any design carved in the foredge flap, as well. We didn't worry about crushing the grain as Islamic binding leather was typically worked quite hard or polished so it ended up very smooth. The head and tail turn-ins were pasted up first, before doing the foredge. The leather was worked flat against the edges of the board to create a sharp edge. The flanges of leather meant to cover the text-block spine were left sticking out. This was then the best time to add extra decoration to the boards. The grain side of the leather was sponged out and a design pressed into the surface. We used pre-cut designs, pressed gently for a few seconds under a nipping press. No heat was applied. The inner foredge strip of leather was adhered last. This was also worked in hard with a bone-folder. We then left it to dry under weight with 2 strips of board cut to fit snugly on either side of the foredge strip. These thinner strips helped hold the leather down in the creases as it dried, creating crisp edges. Once dry, the doublures were then added to the inside of the boards. The great thing about doublures in Islamic bindings is that they are so varied. 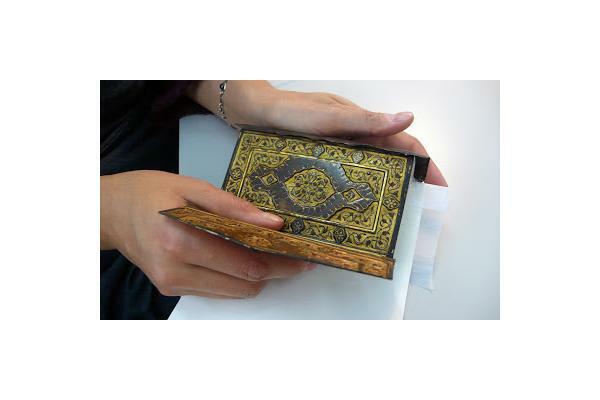 Historic Islamic bindings use textile, lacquer, leather, marbled paper, filigree and a range of other materials to finish the inside of the boards, so the design and colours are completely up to you! I used two pieces of paper cut to the same size as my boards. I also lined the inside of the envelope flap. The paper was wet out so it expanded slightly. It was then pasted up. 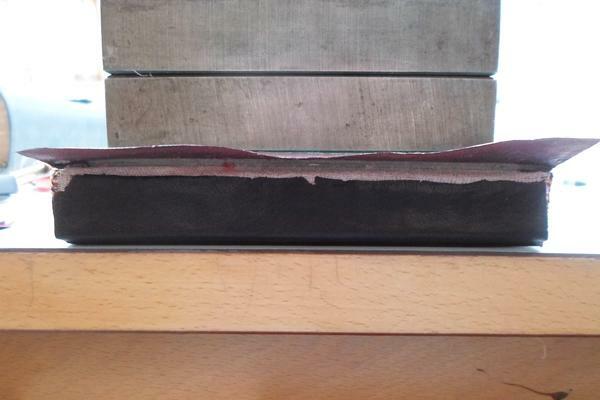 When adhering, we didn't paste down the last 2cm of paper closest to the spine edge of the board; this eventually formed an inner joint, but again there is infinite variety to this part of the Islamic binding structure! Jumping quickly to... Board attachment! We used the two-piece board attachment method, where the two leather flanges extend from the boards and are adhered to overlap on the spine of the textblock. 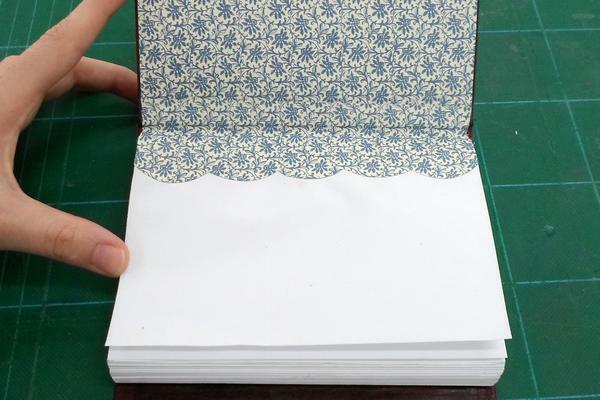 This is a structure which Kristine has observed commonly in small, decorative Islamic bindings. It is best to start with the left-hand (lower) board to ensure it sits squarely with the edges of the text-block. The board is offered up to the textblock, and the pasted leather flange is worked firmly down to the spine. We made sure to work the leather into the joint so that the point where the board hinged was secure and flat. I left this board to dry completely before attaching the second board, lining up the foredges to ensure it all stayed nice and square. You can see here the turn-ins have been lifted on the spine leather. The leather was then trimmed down to the height of the spine. Pardon the grainy photo! 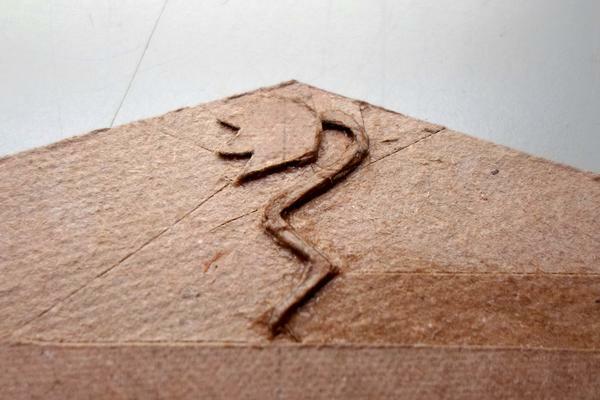 At the head and tail of the spine, I had opened up the leather turn-ins with a craft knife. These little leather tails could then be cut flush to the height of the spine, left long, or fringed depending on the specific type of Islamic binding being discussed. The spine leather flanges blend easily on the spine due to the thinness of the leather, and some additional fine edge paring. This made the leather covering appear to be one complete piece. The leather was again worked hard with a bone-folder, making sure to smooth it down all edges and inside the joints. Once the spine was dry, the boards could be opened and the inner doublure flange pasted down onto the textblock, forming an inner joint. This is just one of many possible ways to finish the inner joint, and Kristine showed us examples of many variations. Finally, the boards were closed with the foredge flap inside the upper board, and the binding was left under weight to finish drying. And it was done!